Amateur filmmaker Stephen Fingleton swings for the fences with a gritty, minimalist, post-apocalyptic, British Isles drama centered around three characters and a world that had lost its mind while they simply attempt to survive. Low budget and low dialogue, this film is definitely ambitious, especially for someone who has only really dabbled in shorts, one of which served as the springboard for this movie. 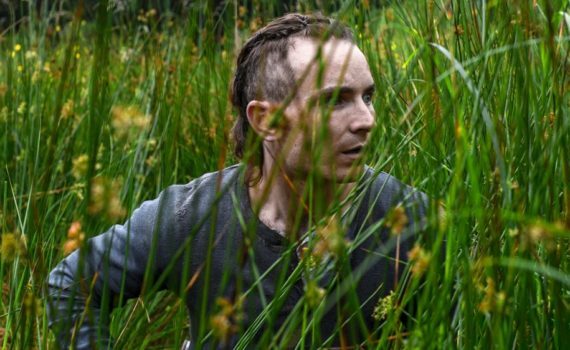 No known names to speak of, a set in the woods, a dingy cabin to produce the action in; it’s honestly a miracle that The Survivalist is as good as it is. Without much in its favor, it still manages to be a heart-pounding and thought-provoking dramatic piece, which is quite a feat, especially given its humble origins. As global oil supplies begin to plummet, so does the population, as our peace and our prosperity are chained to this one good; when it runs out, so might we. Wars are inevitable when nearly 8 billion people are desperate for the same resource, and the result, in this story, is the decimation of humankind. Those unlucky few who are left fight for the scraps that are left behind, and seeds become the most valuable currency. One man, a survivor in a land gone primal, holds out for years on his own, hidden within the forest, defending his food and his life with vicious savagery. But when two women approach him with something specific to trade, his loneliness might cause him to lower his guard, to become careless for the first, and perhaps last, time. Strong stuff for an indie drama done simply, cleanly, and without fanfare, but that might also be exactly why it works. The theatrics are simple and spelled out, the life these characters lead is brutal, cold, and short, the ugly parts of what it would mean to be alive in a time like this aren’t held away from the light. Evil is rampant, sure, but simple instinct makes a comeback as well, and I’m not too quick to call that ‘bad’. Death waits around every corner, but the film does wonders not making that pressure too great, allowing us some entertainment and hope along the way. I was rooting for the characters, the pace is deliberate but well-done, and McCann & Goth both deliver fine performances that allow the movie to move into the dark places that it needs to go. An under-the-radar gem but a film that won’t be for every audience, The Survivalist is worth a watch, a thought, and a recommendation.